Regular readers will note that posts now come later in the day. 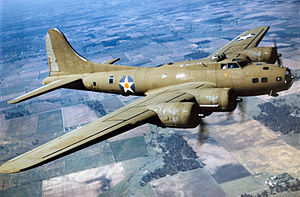 Throughout 1943, U. S. Air Force B-17 bombers carried out raids over Germany. Give up? The place is right, the time is right, the B-17s are right, but the United States Air Force did not exist yet. The service in question was the United States Army Air Force, previously called the United States Army Air Corps. From the beginning of American military aviation, planes flying from ships belonged to the Navy and planes flying from air fields belonged to the Army. That changed with post-war reorganization. The War Department became the Department of the Army, which then joined the Department of the Navy and the newly created Department of the Air Force to become the Department of Defense. The Air Force was new and hungry, and it soon found plenty to feed on. By dropping atomic bombs on Japan, the United States had changed the face of warfare. A bombs, and soon H bombs, became our first line of defense against expected Soviet aggression, and it was the Air Force’s job to deliver them if needed. Within a decade, missiles were ousting planes as the primary means of delivery, and the Air Force became the proprietor of such missiles as the Atlas, Titan, and Minuteman. But not of all missiles. The United States Army developed the Redstone IRBM which launched the first two American astronauts into space, if not orbit. The Redstone was later succeeded by the Pershing which was a cornerstone of the defense of Europe until the eighties. The Navy developed the Polaris and then the Poseidon submarine launched missiles, which were probably, due to their stealthy deployment, a greater deterrent than the missiles developed by the Air Force. Meanwhile, the Army continued to maintain some aircraft for support missions, and with the onset of war in Korea and later Viet Nam, Army helicopters became a major force in the air. Naval jets launched form aircraft carriers were the equal of Air Force planes. Soon the Marine Corps came to maintain what amounts to a mini-air force all its own. It looked like everybody has aircraft and everybody had missiles. The Air Force had additional, more ambitious plans. They intended to launch manned Air Force vehicles into space, first on top of a Thor, then atop an Atlas. The project was called MISS, Man in Space Soonest. The Air Force announced its nine astronauts on June 25, 1958. They included X-15 pilots Scott Crossfield, Joe Walker, John McKay, Robert Rushworth, Robert White — and Neil Armstrong. A month later, MISS was cancelled. Two months later a new government organization called NASA was formed and took up the concepts pioneered by the Air Force. MISS became Project Mercury. The Air Force, however, was not through trying for space. More on that tomorrow. This entry was posted in A Writing Life and tagged forgotten heroes, military, science fiction, spaceflight, writing on April 25, 2017 by sydlogsdon.